Ralph Martin is president of Renewal Ministries. 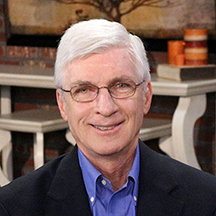 He also hosts The Choices We Face, a widely viewed weekly Catholic television and radio program distributed throughout the world. Ralph holds a doctorate in theology from the Pontifical University of St. Thomas (Angelicum) in Rome and is a professor and the director of Graduate Theology Programs in the New Evangelization at Sacred Heart Major Seminary in the Archdiocese of Detroit. He was named by Pope Benedict XVI as a Consultor to the Pontifical Council for the New Evangelization and was also appointed as a “peritus” to the Synod on the New Evangelization. Ralph is the author of a number of books, the most recent of which are The Urgency of the New Evangelization, The Fulfillment of All Desire, and Will Many Be Saved? He and his wife Anne have six children and sixteen grandchildren and reside in Ann Arbor, Michigan. P.S. Please feel free to share this letter with family, friends and fellow parishioners if you think it would be helpful. No permission needed.